Bet Broncos -1.5 over Cardinals with Karamba. Bet Chiefs -5.5 over the Bengals with 888Sport. Bet Chargers-Titans under 45 with 888Sport. The Broncos should be grateful for the Oakland Raiders, who may be the worst team in the NFL heading into Week 7. If it weren’t for the downtrodden Mighty Jon Grudens, Denver would be the sad-sack club in the AFC West. The Broncos are swooning mightily themselves. After starting at 2-0 (via home wins by a total of four points), Denver has lost four straight games. And the Broncos don’t look very good at all. 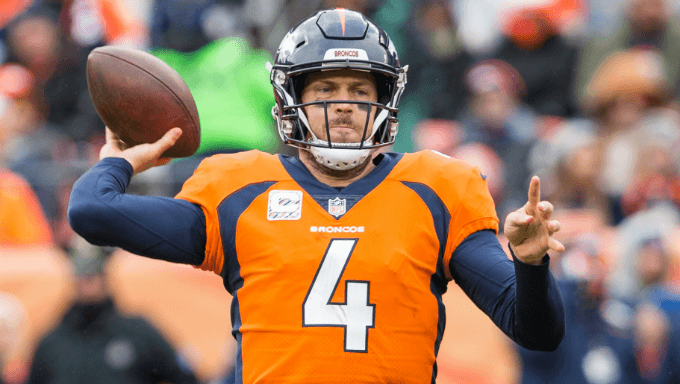 Quarterback Case Keenum, signed as a free agent, has not lived up to expectations. Defensively, Denver is getting gutted, especially against the run. Oakland has allowed 592 rushing yards in the past two games. It’s difficult to keep your defense fresh and your offense on the field when you are allowing about 300 yards a game. The Broncos don’t have much time to think about it. They play at Arizona on Thursday night and are favored against the 1-5 Cardinals. The Broncos might get a break this week. The Cardinals are last in the NFL in rushing offense, averaging just 64 yards a game on the ground. Denver GM and former Hall for Fame quarterback John Elway called his defense “soft” this week. It’s time they respond on a short week. The Chiefs are among the defeated. They lost a tremendous game, at New England in Week 6. It was a 43-40 thriller. We shouldn’t change our opinions of the Chiefs, because of one loss, though. While they’re suspect defensively, this offense will keep this team in very game. First-time starter Patrick Mahomes keeps answering challenges He was down against the Patriots but fought and brought his team back. The Chiefs are here for the long haul. The Chargers are starting to roll. After beginning the season 1-2, the Chargers have won three straight games and loom just one game behind the Chiefs – who beat the Chargers on the road in Week 1 – in the AFC West. The Chargers may be the third best team in the weak AFC behind the Chiefs and Patriots. Quarterback Philip Rivers and the offense is really clicking. The major injury issue hovering over the AFC West going into Week 7 is in Los Angeles with defensive end Joey Bosa. The star pass-rusher has been out all regular season with a bone bruise. He is expected to remain out into November, which is a killer for the Chargers. Kansas City’s Justin Houston is dealing with a hamstring injury. In fact, Houston could be out for a few weeks, which isn’t good for a defense that is not playing at a high level. Also, star safety Eric Berry remains out with Achilles and heel injuries. Karamba has the Broncos as a 1.5-point road favorite over the Cardinals. The Broncos are bad, but not as bad as the Cardinals. I think they can handle the short week with the short trip to Arizona. I think Denver matches up well and should have enough talent to win the game. Back the Broncos -1.5 with Karamba. 888Sport has the Chiefs as a 5.5-point home favorite over Cincinnati. I like the Chiefs in this Sunday night game. The 4-2 Bengals aren’t bad, but I think the Chiefs will outclass them and win this game fairly easily. Bet Kansas City -5.5 with 888Sport. 888Sport has set the Chargers-Titans over/under at 45. And that seems high to me. The Chargers are rolling. The Titans are not. Tennessee’s offense is in the dumps, but the Titans play decent defense. Plus, this game is in London on Sunday. I can see fatigue playing an issue. These England games are often not close. I can see the Chargers winning this game something like 24-10. The under seems safe, so take it with 888Sport.